Proper training, backed up by adequate knowledge and understanding, is essential in the field of cryogenics.Two hands connected to one brain is always a plus because most of cryogenics design, testing, and operations must be learned by experience. The same is even more true for the first cousin of cryogenics, high vacuum. Whether one is concerned with hands-on operations, new designs & approaches, standards & policies, research studies, or business development, training is important for safety in cryogenics. Safety considerations extend from personnel safety (operations & production) to system safety (designs & approaches) to public safety (standards & policies). Public education about safety in cryogenics is also important to promote proper understanding and address incorrect perceptions. For example, the words "cryogenic" and "hydrogen" alone may sound scary to some; put them together and panic could be incited! The horror of the Hindenburg remains a prominent fixture in American thought today. How many people realize that gasoline, compared to hydrogen, has a much wider range of flammability in air? Technifab Products, Inc. has a four page document LT-30084 entitled Cryogenic Equipment Safety & Handling Guide that covers the general precautions with cryogenic equipment operation as well as specific warnings on the use of oxygen and hydrogen. The following safety course materials, pamphlets, and guides are just a few of those available on-line. 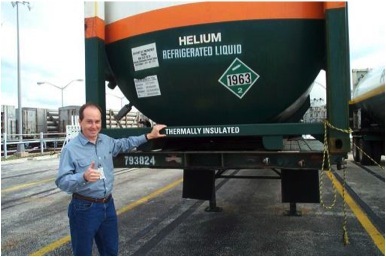 Refrigerated liquid tanker trailers have an outstanding safety record.